Before the cold arrives, make sure that your home is ready for it. 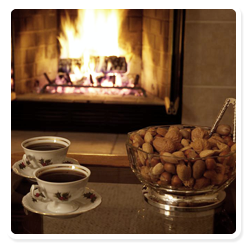 Wright's Gas Company offers a top-quality selection of gas heaters and fireplaces that take the chill away. These machines are both attractive and durable so they add to your home in more ways than one. Whatever product or appliance you choose is certain to provide you with years of comfort. We carry ProCom™, HEATSTAR™, and HearthRite™ brands because of their great pricing and their efficiency. Although HEATSTAR products are our most popular heaters, everything we sell offers effective heating. All heaters come with a manufacturer's warranty; however, we don't accept returns because our products are guaranteed. If a heater doesn't function, correctly we will exchange it. Call for price ranges. Create a cozy feeling in your home with a gas fireplace from Wright's Gas Company. To provide you with a variety of styles and designs, we carry brands that include Monessen™, Real Fyre™, Empire™, Superior™, FireMagic™, HearthRite, Modern Flames™, and many more. Our most popular fireplaces are our Empire™, Superior™, and Monessen™ models because they look great and are affordable. We do not accept returns, but we will exchange products that don't work properly. All fireplaces come with manufacturers' guarantees.